As Editor-in-Chief, I am always looking for new brands that I think are worthy for our readers to know about, and ultimately incorporate into their own style. I’m of the mindset that less is more, especially when it comes to fashion. 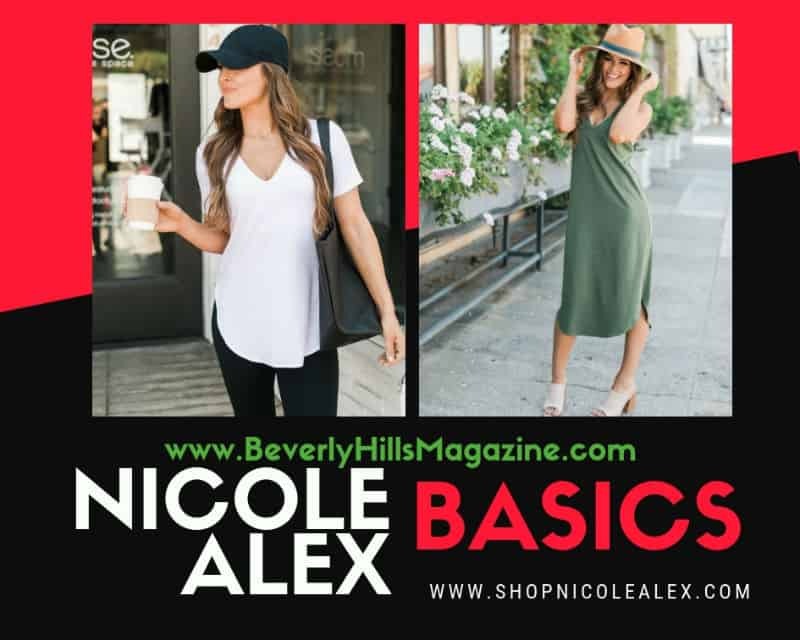 So when I discovered the basics line called Nicole Alex, I was excited. I love this collection of simple yet feminine clothes that are comfortable, casual, but stylish. You can dress them up or down, depending on what shoes and handbag you wear them with. I’m a big fan of the Luna, Pier, and Chloe dresses. I believe women should live in dresses! I also love that you can lounge in them too. You really do get the best of both worlds with Nicole Alex. Let’s get to know the Founder and designer, Nicole Zabal, who shares a little bit of insight behind the brand. Beverly Hills Magazine: Tell us a little bit about yourself…Where you grew up, family, currently living, hobbies, etc? Nicole Zabal: I’m originally from New Jersey and graduated from Parsons School of Design in NYC. I moved to Los Angles nine years ago (this week)! Growing up, my father was the CEO and founder of a financial software company and my mom worked in advertising and then became a full-time artist. Both of my parents have always been very into fashion and, needless to say, I had a pretty amazing closet full of clothes growing up, and eventually got awarded “best dressed” in my senior high school yearbook. These days I prefer to dress more comfy/casual than super trendy. I’m super into fitness, so I’m in workout clothes a lot of the time, and I like to be outdoors and go on hikes or rent the occasional kayak or paddle board. You can usually find me doing something sporty in my spare time or going to an art exhibit. Beverly Hills Magazine: How did you get into the fashion industry? Nicole Zabal: Growing up, my mom was very fashion forward and subscribed to all the fashion magazines. I would go into her closet and try on her amazing designer dresses and shoes just waiting for the day that they would fit me. She was also an artist and interior decorator and naturally, I ended up loving art and all things creative. When I got to college, I interned at a few apparel companies in NYC and that’s when I knew I wanted to be in fashion. Nicole Zabal: My inspiration really comes from wanting to feel comfortable and easily look put together. I worked from home for years, and I found myself wearing a lot of athletic wear: leggings, tank tops with built-in bras, tennis shoes. I felt like I was in a bit of a rut, style-wise. I loved the idea of being able to toss on a top with built-in support and a comfy pair of leggings, but there wasn’t anything on the market that looked elevated, aside from your typical workout clothes. That was my lightbulb moment. Nicole Zabal: I usually start with basic silhouettes that I like wearing from my own closet, and then think of ways I can improve or modify them. That could mean adding a curved hemline to make a t-shirt look less boxy, or changing the neckline on a tank top to make a shape more feminine. I also think about incorporating seasonal pops of color, something you’ll see reflected in our new SS19 collection next year. Nicoel Zabal: We design built-in shelf bras in all of our tops and dresses – I truly believe that’s our secret weapon! There really aren’t many apparel brands that feature shelf bras, outside of active wear. Nicole Zabal: Effortless chic! I love a neutral color palette and flowy, figure-flattering silhouettes. I believe NICOLE ALEX pieces should always blend seamlessly into your wardrobe, and enhance your everyday style. Nicole Zabal: There are so many different aspects of fashion and I love how it’s constantly evolving and fashion gives people the ability to express themselves in unique ways. Beverly Hills Magazine: What do you love most about it? Nicole Zabal: I love how tactile and expressive the design process is. You can tell an entire brand story in fashion, from fabric to fit to photography. Nicole Zabal: As a new brand, it’s very easy to feel discouraged when you compare yourself to other designers/labels – especially in this social media world we live in! I remind myself that Instagram is a highlight reel, and every brand has challenges, no matter how big or small. I also dislike that fashion has a way of categorizing people and opening them up to being judged by what brands they wear. I never cared about brand names and I’ve always just worn what I liked. Nicole Zabal: All of our tops & dresses were fun to design, because each one contains our signature twist: a built-in shelf bra! It was my mission to create the perfect shelf bra, and ours features four way stretch, a plush elastic band, and seamless construction. It really is a hidden wonder and we put them in silhouettes that have never had a shelf bra before! Nicole Zabal: I think of style as personal expression and creating your own personal “brand” with whatever outfits you decide to put together from shoes to clothes to accessories. Beverly Hills Magazine: What makes clothing beautiful? Nicole Zabal: Attention to detail. A crisp white t-shirt can be just as beautiful as a couture gown – it’s all about creating a flattering silhouette, with luxe fabric and clean finishes. Something as simple as a hemline can elevate your whole look. Beverly Hills Magazine: What can our readers look forward to from your future collection? Nicole Zabal: Right now, we’ve been focusing our efforts online, but we hope to expand into boutiques. We are planning our next collection, but I don’t want to give anything away yet! Nicole Zabal: Never be afraid to ask questions, the industry is constantly evolving and there is always something new to learn. I interned and then worked in all facets of fashion, from PR to sales, which gave me invaluable experience that I can apply now to my own line. SHOP NOW!!! www.shopnicolealex.com, or follow Nicole Alex on Instagram @shopnicolealex!